Country music star Trace Adkins and Rhonda Forlaw Adkins were married for seventeen years before divorcing in 2015. More here. 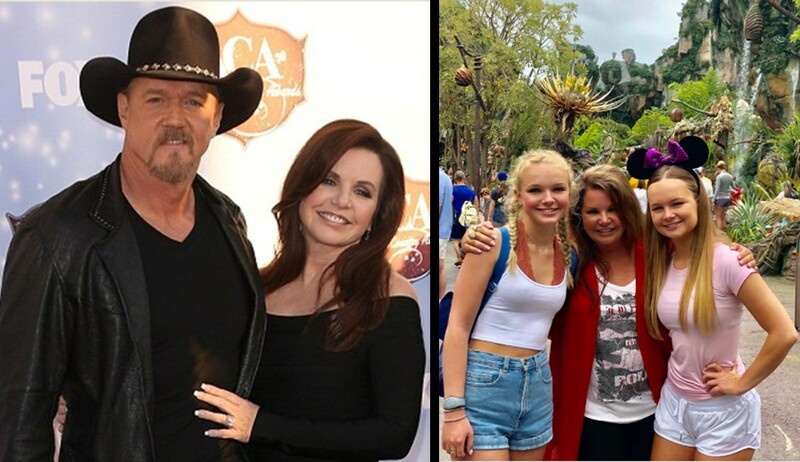 Country music artist Trace Adkins has lived a very eventful life. The rough and tumble crooner has survived multiple injuries, three divorces, and alcohol addiction. Yet, somehow, he has always managed to make it. Learn more about his marriage to Rhonda Forlaw Adkins below! Prior to meeting Rhonda, Trace Adkins had been twice married and divorced. His first wife, Barbara Lewis, was Trace’s high school sweetheart. They married and had two daughters, Tarah and Sarah. Their marriage ended after only 4 years. In 1991, Trace married Julie Curtis. Their union ended in 1994 after she accidentally shot Trace in the chest during an argument. His injuries left him fighting for his life. Surprisingly enough, the singer didn’t press charges against Curtis and the couple divorced after three years of marriage. Trace managed to propose to Rhonda during his first performance at the Grand Ole Opry in 1996. The audience was given a special treat when he got down on his knee and popped the question. Rhonda accepted his proposal on stage in front of thousands of Opry fans. Trace’s grand proposal was followed by a lavish Nashville wedding. Trace Adkins married Rhonda Forlaw on May 11, 1997. The couple exchanged vows at Nashville’s beautiful historic Belle Meade Mansion before more than 500 guests. Following the exchange of wedding rings, Trace serenaded Rhonda with a song he wrote with Kenny Beard, “The Rest of Mine.” The event was described as being a fairy tale. Sadly, their union didn’t come with a ‘happily ever after’ ending. In March 2014, Rhonda filed for divorce citing irreconcilable differences. She also filed for primary custody of their three daughters – Mackenzie (21), Brianna (17), and Trinity (14). According to Trace’s attorney, Larry Hayes, Jr, the pair settled their divorce amicably in the first half of 2015. We wish Trace, Rhonda, and their daughters the best as they are navigating this next chapter of their lives! Share this look at Rhonda Forlaw Adkins with other country music fans!